The inspiration for these boxes came from a workshop by Nick Bantock (author of the Griffin and Sabine book series). In one creative excercise, we had to choose a suit and a face card from playing cards, and then further explore what characteristics or imagery was associated with that combination. From that we developed a large card for that character. 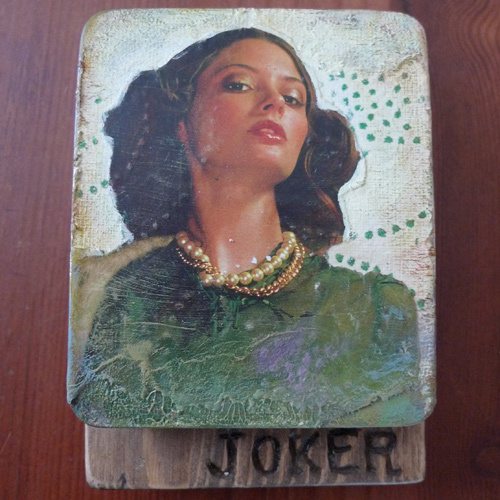 I've continued the spirit of that excercise, and created a series of 5 boxes respresenting my King of Clubs, Queen of Spades, Jack of Diamonds, Ace of Hearts, and I've also thrown in the Joker, to add some drama to the bunch as the trump card. These boxes are like little devotional objects for each of my characters. The exteriors show their outer appearances, and the interiors delve deeper into their characters, revealing their traits and secrets. Each character has an element associcated with it, as well as a color. And the edges of each wooden base has a pattern unique to each character.